In a small town, news travels fast. So, when New York State regulators began developing energy policy that might save their local nuclear power plant from shutting down, residents in the town of Oswego felt a renewed sense of optimism. “When the Clean Energy Standard was brought up, there was a lot of hope,” says Chelsea Gill, site materials program engineer at the James A. FitzPatrick Nuclear Power Plant, six miles northeast of the upstate New York town. Citing the “continued deteriorating economics of the facility,” Entergy Corp.—FitzPatrick’s owner at the time—announced in November 2015 that the plant would be prematurely closed. By the following month, state regulators introduced a Clean Energy Standard (CES) that included a separate Zero Emissions Credit (ZEC) program to compensate the zero-emissions attributes of nuclear power plants like FitzPatrick. The CES played a pivotal role in changing the plant’s prospects for continued operation, and in August 2016 Exelon, the owner of three other New York nuclear plants, offered to purchase FitzPatrick from Entergy. On March 31, 2017, Exelon officially assumed ownership of FitzPatrick. When they were originally going to shut down it was very sad…But when they mentioned the Clean Energy Standard, it definitely changed the environment. People were a lot more hopeful, they were in a better mood. Gill knows the story well, because she lived it. Despite being a rising star at “Fitz,” as the plant is locally known, Gill’s position at the plant was eliminated while plans to shutter the plant moved forward. Thanks in part to a program to retrain and rehire nuclear workers, Gill was able to transfer to Exelon’s nearby Nine Mile Point Nuclear Power Plant. She remembers the mood in the town when Entergy announced its plans to shutter the plant. When the debate over the CES began, an outpouring of local support for the plan quickly became evident, Gill said. Losing Fitz was one change the town was not going to take lying down. Eventually, the CES was put into place and New York’s upstate nuclear power plants were able to qualify for ZECs. As a result, Gill was able to transfer back to FitzPatrick, where she now manages plant training and maintenance systems. Asked if her job would still be here today without New York’s CES, Gill is blunt. Of course, it wasn’t only Gill’s job that was saved. FitzPatrick employs 600 full-time plant workers and drives more than $500 million in annual economic activity. The loss of jobs would also have had a substantial knock-on effect on the tax base for the small town and the county, jeopardizing the budgets of local governments and schools. And other upstate nuclear power plants could have shuttered as well without the CES: those facilities employ nearly 2,500 workers. 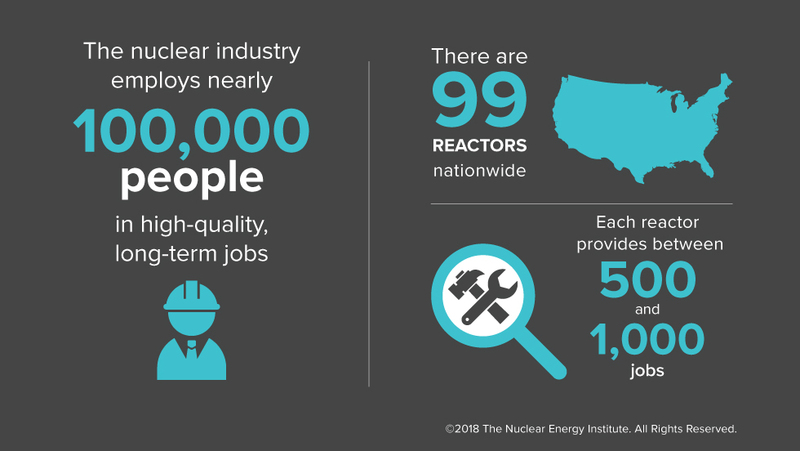 Overall, the U.S. nuclear industry employs nearly 100,000 people in high-quality, long-term jobs at nuclear plants, vendors and manufacturers. Each of America’s 99 reactors provides approximately 500 to 1,000 jobs. These plants are often located in rural communities, where those hundreds of skilled jobs provide a major, ongoing stimulus to the local economy and boost the tax base. When the Vermont Yankee plant in Vernon, Vermont, shut down in 2014, the town had to cut its budget in half. State policy makers have woken up to the need to preserve nuclear power plants at risk of premature closure due to short-term market inefficiencies. Following New York’s CES initiative, Illinois and New Jersey instituted their own ZEC programs, while Connecticut passed a law allowing its Millstone Power Station to compete with other non-emitting sources. Similar policies supporting nuclear energy are under consideration in Ohio and Pennsylvania. NEI Senior Director of Policy Development Matt Crozat says these states are simply ensuring all zero-emission electricity sources can compete fairly in the marketplace. Keeping the nation’s nuclear power plants running also is a top priority of the Trump administration. In a recent editorial, Edward McGinnis, the U.S. Department of Energy’s principal deputy assistant secretary for the office of nuclear energy, said the country’s nuclear power plants are vital for maintaining the resilience of the electric grid and boosting national security. As for Gill, she is back at “Fitz” doing what she loves day in, day out—going through her checklists to ensure the plant is safely producing electricity and running efficiently. She is involved in Exelon’s Emerging Leaders program and in the local Women in Nuclear chapter. She previously served as president of FitzPatrick’s North American Young Generation in Nuclear (NAYGN) chapter. Gill and her coworkers aren’t just members of the local community—they are also stewards, giving back locally through food drives, litter collection, and fundraising. But it’s the job that keeps her motivated.